Broccoli is one of those vegetables that it seems like you really like it, or you hate it. What I’ve found is that a lot of whether you like it or hate it depends on how you make it. Really what I’m saying is get ready to love broccoli – this Asian Broccoli Salad is amazing! The great thing about this salad is that it’s topped with this seriously delicious Asian style dressing. This dressing is one that has a peanut butter base (use reduced fat or reconstitute powdered peanut butter to keep the points low). Added to that creamy and delicious peanut butter is some soy sauce, sesame oil, ginger, garlic, honey and rice wine vinegar. 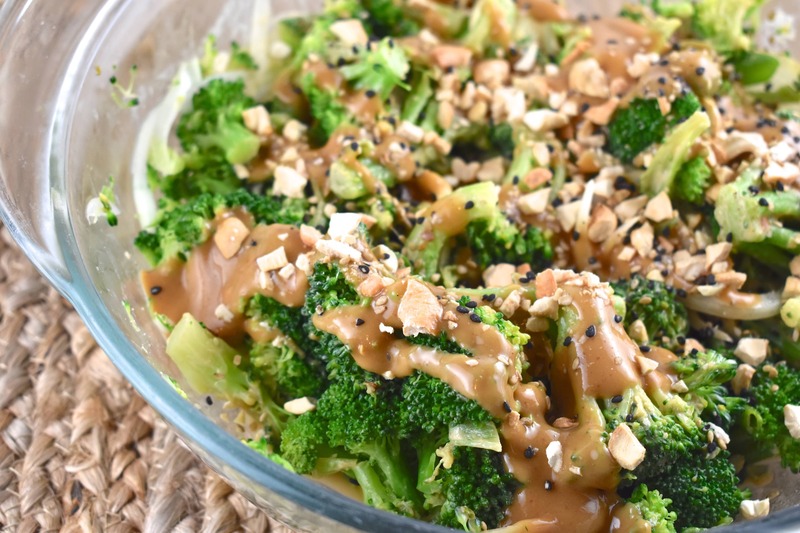 The soy sauce deepens the flavor and the sesame, ginger and vinegar add that delicious Asian flavor to the dressing. In fact, you’ll probably just want to make up a recipe of this dressing and keep it in a jar in the refrigerator – it’s that good. Now, let’s get back to the broccoli. One of the best things about this salad, apart from the amazing dressing, is that the broccoli is lightly steamed before the salad is made. It’s important to just BARELY steam the broccoli (1-2 minutes) so that it’s just beginning to get tender, but is still bright green, crisp and full of those nutrients. Lightly steaming the broccoli seems to give it a little more of a smoother flavor than raw broccoli. Keeping the nutrients in the broccoli is one of the main reasons why you’re eating the broccoli – for the nutrition. It’s important to pack in plenty of nutrients in fresh and steamed vegetables and fruit each day. Eating a diet high in fiber is a great way to ensure that you’re doing what you can to keep healthy, and it’s also a great way to help cut down on cravings. Fiber helps you to feel full longer, and you can have larger servings of fiber rich foods. This means that you’re getting more bang for your buck – you get the nutrients your body needs, and you feel full and satisfied, and are less likely to have cravings and make poor choices because of the cravings. If you’re one of the people that always just microwaves or boils the daylights out of your vegetables – listen up. There are two easy ways to steam broccoli and neither of them leave you with limp, sickly green broccoli that is devoid of flavor. It’s important to cut the broccoli into uniform pieces since they will cook at the same rate. Once you’ve done that you have two options – a microwave or a pot of water. To steam in the microwave, place your broccoli on a microwave safe plate and cover with a triple layer of damp paper towels. Steam for 30-60 seconds at a time, or until desired tenderness. The length of time will depend on the microwave, but the average time is 2-5 minutes. To steam on the stove, place about 2 inches of water in a pot and insert the steamer basket. The water should not touch the basket, if it does, remove some water. Bring the water to a boil and add the vegetables. Reduce the heat to a simmer and cook for 2-5 minutes, or until crisp-tender. WANT TO TRY MORE RECIPES WITH BROCCOLI? CHECK THESE OUT! An amazingly delicious way to enjoy broccoli, this salad makes a wonderful healthy lunch or dinner side dish recipe. Steam broccoli for 1-2 minutes. Broccoli should be crisp tender, and bright green. Rinse under cold water immediately. Transfer broccoli to large bowl with green onions and red onions. In a small bowl, whisk together the peanut butter, soy sauce, rice wine vinegar, sesame oil, ginger, garlic, and honey. Pour over broccoli and toss well. Top salad with chopped cashews and toasted sesame seeds. When will you have printing options?